My husband and I have lived in our first home for a little over a year and a half. In that time, we have learned many of the ins-and-outs of our home that we couldn’t have known before we purchased it. We have learned little things about our home that make us smile, and some things that make us want to pull our hair out! Our kitchen pantry (or lack there of) causes the latter. We don’t have a designated pantry area in our kitchen at this point. We are using the two cabinets on either side of the stove as a pantry. As you can see from the picture above, prior to the organization, the pantry was not in a good state. Everything was just tossed into the pantry with ZERO organization in place. I had no clue how much of anything I had! I was constantly buying duplicates and triplicates of everything because I could easily access what I had! When I saw these soda can organizers at the Dollar Tree, I knew that they would be the perfect solution for our pantry! These easily fit multiple cans and are the perfect width and depth for our cabinets! Organizing our space was going to be the EASIEST project! Once I organized all the product I was keeping and disposed of what was no longer wanted, I needed to label the organizers. Luckily, the Dollar Tree had the perfect product for this project! These Adhesive Label Holders work PERFECTLY to label each container! These were such a great invention! Simply write the name on the provided yardstick and slip it into the adhesive sleeve! Then, you can just stick it onto the organizer! There you have it! A simple, easy, DIY, inexpensive way to organize your pantry! Total investment for this project for me was $16! Now, I love to go to my kitchen, open my pantry, and admire how organized the space is! Want to do this project in YOUR kitchen? Want to have the same set that I used to organize my pantry? As a way to say thank you to all of you for your love and support, I am hosting a GIVEAWAY! I will be giving away 20 of these organizers and 2 packs of adhesive labels to one lucky winner! Here’s how you can enter! You must be a subscriber of my YouTube Channel and my blog! To subscribe to my YouTube channel, click the video below. Once you have watched the video, click the red Subscribe button below my name! To subscribe to my blog, click the blue Follow button on the right of the blog post! You must also post a comment on THIS blog to be entered! Check out the video below to see exactly how I organized our pantry with Dollar Tree products! Need more Dollar Tree? Here is my most recent Shop with Me Dollar Tree video! I also explain all the details of the giveaway in this video as well! Thank you all so much! I wish you all the best of luck in this giveaway! I’d like to enter the giveaway! Great! Have you subscribed to my blog? wow this is totally BRILLIANT!!!! Love it! Thank you so much for doing this giveaway!!! Kieran your a person after my own heart. I love thrift shopping. I have a very hard time paying retail prices anymore. I just started shopping at Dollar Tree recently but it’s not a big store at all. I would love to win your giveaway. Have a great day! I watch you on YouTube all the time. Your videos are so inspirational!!! I have been looking for these soda can organizers since your video, they are impossible to find. I am organizing my daughter’s kitchen and with extremely little cupboard space these would come in handy!!! I would love a chance at the giveaway. My local dollar tree never gets the good organizing products. Hi I would like to be entered in the giveaway. My family recently bought and moved into our first home. I’m still in the process of figuring out the best way to organize my new kitchen I think these would be perfect. They don’t have them at my dollar tree. I love to watch you on You Tube, I follow you on in stag ram and now I found your Vlog! Next to follow you on Facebook! You are very inspirational! This is such a great idea!! I have been on the look out for the soda can organizers. I even checked the website in hopes of having them shipped to my local store for pick up! So far no luck!! I love organized cabinets and Pantries! Then everyone can find things easily, and nothing goes to waste! Thanks very much for picking those up, and hosting the giveaway😀 I am a YouTube and blog subscriber! Your kindness is much appreciated! Love your Channel and now following your blog!! Hoping to win the organizers! Awesome ideas! I will be using these ideas when I move into a tiny apartment later this spring. Yes I am subscribed to both YouTube and your blog. Yes I want to enter. Love your channel and videos! I told my husband you reminded me of myself. I have 3 sisters, vegetarian, animal lover and we share the same love for vintage style. I would love to be apart of your giveaway. Thanks! Would love to win the organizers my pantry is a mess girl lol. I would love to enter your giveaway! I have Bren looking for those pop can organizers forever. I also subscribed to your blog!! Thanks for being so generous!! I would like to win the organizers girl my pantry is a mess lol!! Thank for have a giveaway how fun.. Thank you for sharing. Please enter me in your giveaway. I love watching your organization tips, especially love watching your thrift hauls and garage sale hauls!!!!! Thanks for keeping me motivated!!! Hope I did all this right 🙂 subscribed to both! I love the can holders. I do prepping, and this would be a good way to store a lot of the same products I use and keep them rotated! Thanks for offering the give away. I really enjoy your upbeat joy of life! Love it! Not having a pantry is super hard! You did amazing making the most with what you have. Thanks for sharing. I love these containers. I need to reorganize my cabinets so badly. It would be nice to not have to dig to find something! These containers would be great for juice concentrate in the freezer also! Love all of your tips!! I’m subscribed to your blog and YouTube & hope to win so I can redo my own pantry! I am a subscriber to your YouTube channel and now a subscriber to your blog. Willyou please enter me into the giveaway? Live your You Tube channel and recently joined ur blog as well! Love all your tips! I found your youtube channel a few weeks ago. I gother a kick out of the video you and mom went thrift shopping. LoL (your scarf has seen better days) I think it still has many more to see. Thanks for all the great tips and for the chance to win those very hard to find can storage containers. I need to go to this store! My dollar tree needs to step it up. Love all your posts! Following your blog! Thanks for entering me for the give away! I would love to enter your giveaway for the organizer’s and labels. I’ve managed to find a few of them, but not enough to finish the organization in my kitchen. 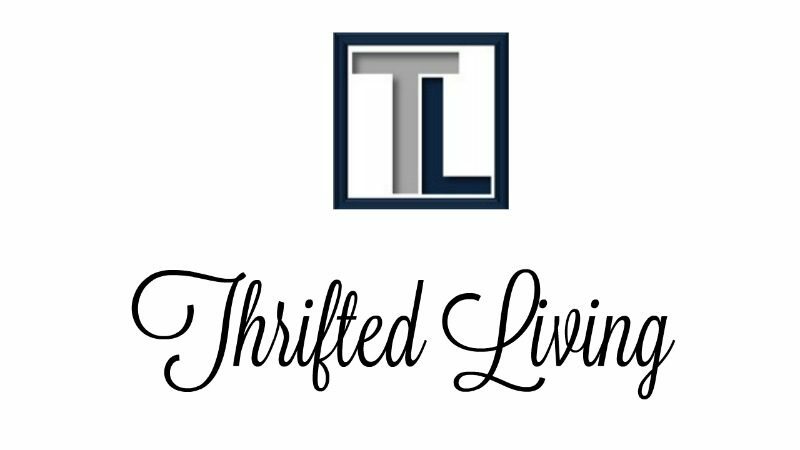 I’ve been watching your channel since before you changed the name to Thrifted Living. I look forward to all of your videos. Please continue to post them! Nice giveaway! None of the dollar trees around me carry the nicer organizational bins, boxers, etc! Thanks for the opportunity. I like how your pantry came out. To bad you can’t come to Florida and do mine! I live a couple hours from Disney….just saying! Haha. I just found your channel and blog. I’d like to be entered in the giveaway. My pantry is a mess hahaha. Your pantry looks amazing! I love the can organizers. Would love to be in your giveaway.😁.. I love your YouTube channel and your blog! Thanks for entering me for the giveaway! I have been trying to find these organizers with no luck. I would love to enter your giveaway. I love your thrifting videos and would love to win the organizers. Kieren, Thanks for the opportunity to win these organizers. My local Dollar Tree never has the fabulous items I see on your channel (or Do it on a Dime). PS: I adore your videos!! You are just adorable and I love your enthusiasm and bubbly personality! Finding you must have been divine intervention. I just sat down to take a break and cool down after frantically searching my entire kitchen for a particular pasta that was to be served for dinner tonight. My kitchen is very small but not organized very well and organization is key in small spaces! So I made up my mind that I am going to get my cupboards organized post-haste! I would love to win your little bins to get things started! Even if I am not the lucky recipient, I still consider finding your vlogs a win! I may just begin some binge watching right after dinner! Happy Spring! Hi Kieran, thanks for the wonderful ideas you share about thrifting and organizing. I’m a silent follower and this is my very first comment. Thanks for the giveaway. i would like to enter.